PPL is currently inviting contributions for a book entitled Institution is a Verb documenting, indexing, and reporting on 7 years of operation at the lab site in Brooklyn where PERFORMANCY FORUM largely took place 2012-2018. The book will be published in collaboration with The Operating System. Please click HERE for the call for book contributions! Abstracts for more in-depth pieces as well as other materials due March 15, 2019. 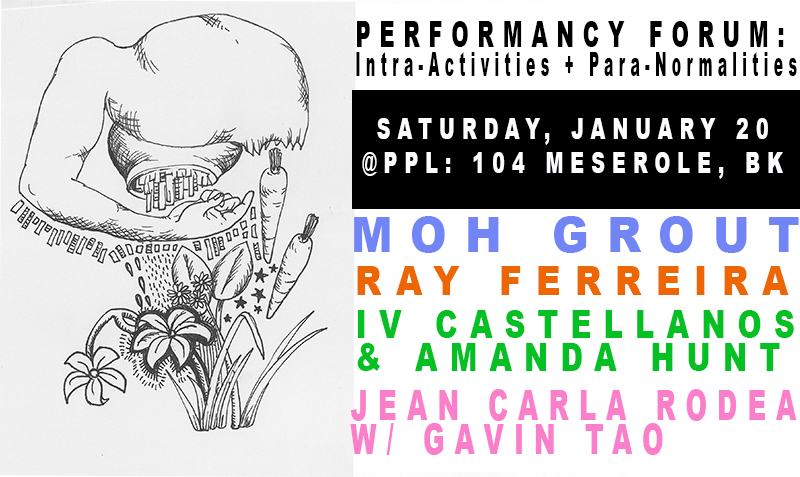 104 MESEROLE STREET has been Panoply Performance Laboratory (PPL)” organized by the collective of the same name since 2012. As of January 1, 2019, the site will be renamed “IV Soldiers,” organized by IV Castellanos and Amanda Hunt. Under the name PPL, the site has operated as a laboratory for the performance art communities of Brooklyn and beyond, home to hundreds of events, gatherings, meetings, exhibitions, thinktanking sessions, projects, and performances. 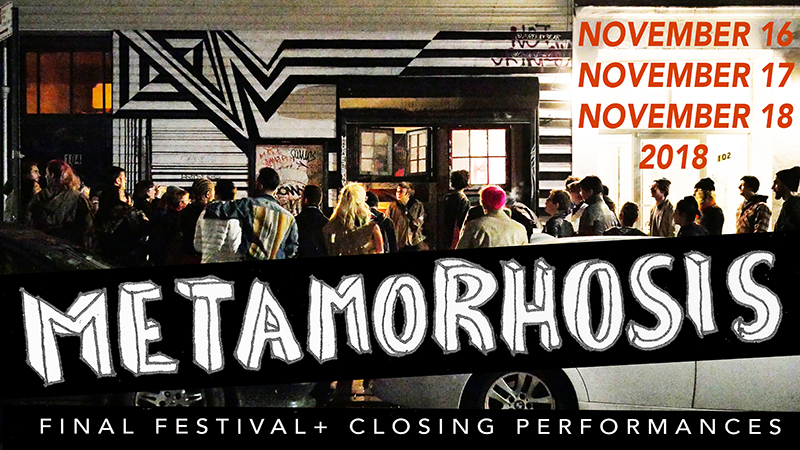 METAMORPHOSIS celebrates the movement mentalities and states of constant adaptation and (intra)relationality that (in)form our practices and projects, culminating 7+ years of work by artists with practices centralizing liveness, presence, and social situation/interaction and activation. 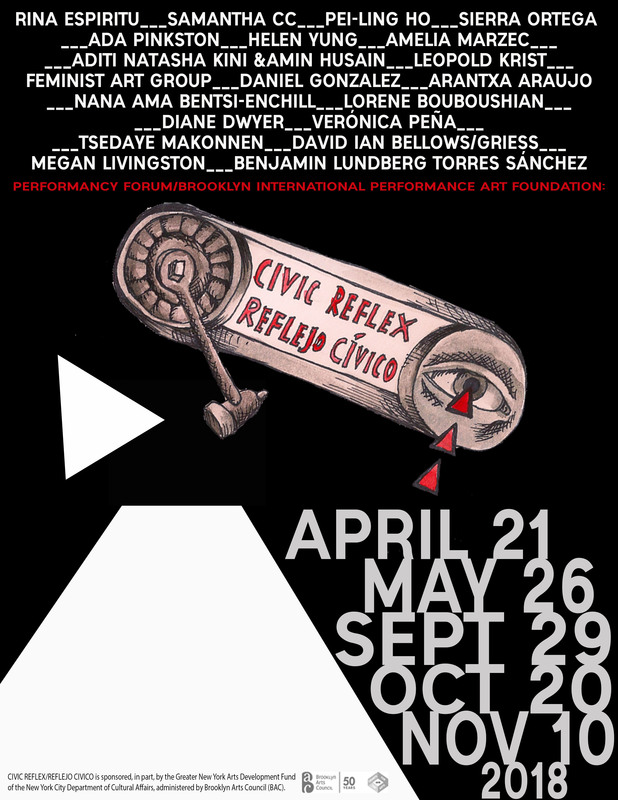 CIVIC REFLEX/REFLEJO CIVICO is sponsored, in part, by the Greater New York Arts Development Fund of the New York City Department of Cultural Affairs, administered by Brooklyn Arts Council (BAC). PERFORMANCY FORUM: CONTRACEPTION AND CONTRABAND. previous to our current location, PERFORMANCY FORUMs had been held at Vaudeville Park (2011-2013) and Surreal Estate (2009-2012) and have also been held in Berlin at Liebig12 and Meinblau, at Columbia University, MANA Contemporary in Chicago, CAID/Spread Art in Detroit, and elsewhere.